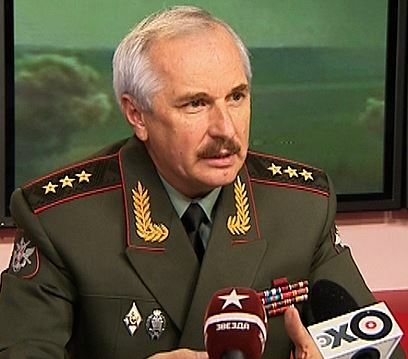 Chief of the Main Directorate of Cadres (GUK) — head of personnel for the MOD, General-Colonel Viktor Goremykin was on-stage Friday, 3 April as the latest spokesman for contract service, i.e. the military’s professional enlisted recruitment program. This is an interesting, if subtle, shift. More often in the past, the General Staff’s Main Organization-Mobilization Directorate (GOMU) spoke to contract manning issues. GUK has typically dealt more with officer promotions and assignments. The GUK’s Goremykin was commissioned into the army, but his mid-career training came in counterintelligence at the FSK Academy (soon renamed the FSB Academy). So perhaps he was a KGB “special section” guy or osobist from his earliest days as an officer. His path is reminiscent of his immediate boss, Nikolay Pankov. According to TASS, Goremykin told the assembled media that the MOD will very soon have 300,000 contractees, because it now has exactly 299,508. He added that the military gained 80,000-90,000 men on contract service in 2013 and 2014, and has added 19,000 in 2015 thus far. If, from this 299,508, we subtract 90,000 + 90,000 + 19,000, the Russian MOD had only 100,508 contractees as recently as 31 December 2012. Pankov claimed 186,000 contractees at the start of 2013. The 85,492-man discrepancy represents contract attrition over the last 27 months, or an average loss of 3,166 contractees — an entire brigade of recruits — every 30 days. As Mokrushin notes, General Staff Chief Valeriy Gerasimov said there were only 295,000 contractees in late December. If 19,000 were added in 2015 but the total is only 299,508, then a net of only 4,508 was added due to the loss of 14,492 contractees during those months. Call that five percent attrition, but annualized it’s 20 percent. We were told in early November 2014 that the Russian military, for the first time, had more contractees than conscripts. Since there were 305,000 conscripts at the time, ipso facto, contractees must have numbered at least 305,001. You can add the November-December losses — 10,001 — to 14,492 and you get 24,493 lost in five months. That’s 4,899 per month on average — call that two brigades of recruits lost — every 30 days. Russian recruiting centers have to keep a torrid pace just to stay even with these losses. But back to Goremykin. He said the MOD’s goal for 2015 is to reach 352,000 contractees, and plans for the outyears haven’t changed — 425,000 by 2017, and 499,000 by 2020. With possible attrition of 27,000 over the next nine months, the MOD will have to recruit 79,000 contractees to be at 352,000 by the end of 2015. Goremykin indicated the MOD will continue allowing conscripts with higher education to serve two years as contractees instead of one as draftees. The percentage choosing this option isn’t large, but it’s growing, according to him. The six-year service requirement to qualify for a military-backed mortgage may be dropped to five years just to encourage this category of contractees to re-up. The GUK chief said there are plans to make the Russian Navy almost 100 percent contractee, starting with its submarine forces first, then most of its surface forces. As always, it’s difficult to trust the MOD’s numbers; they tell us about additions, but not subtractions. As shorthand, we tend to call newly recruited and enlisted Russian contractees professionals when, in fact, they have just signed up to become professional. Whether they do is a function of whether they stay, get trained, and become experienced. One senior Russian commander has said he considers soldiers professionals when they’ve served two or more contracts (6+ years). This entry was posted in Manpower, Shoygu's Reforms and tagged Contract Service, Contractees, GOMU, GUK, Manning, NCOs, Viktor Goremykin. Bookmark the permalink. Combate atrittion? What do you mean, losses in SE Ukraine??? Not at all . . . contractee attrition, men who were serving on contract who either don’t complete a contract term or don’t reenlist.